A month has almost gone by while using giffgaff’s service and I thought I’d share my thoughts and views on their service thus far. I mainly chose this package for the “Unlimited internet” and for the “Unlimited texts”. Both have fared quite well, and I’ll first share my experiences with the 3G/internet usage below. giffgaff offer these packages using the backbone of 02’s signal network, so the 3G connection in London is quite well connected and strong. I’ve made use of the “unlimited internet” by having hours and hours of VOIP (Voice Over Internet Protocol) calls using applications such as Skype, LINE and KaKaoTalk to communicate to my girlfriend in South Korea and to friends and family in Taiwan. While it’s quite flaky in certain areas, that’s expected; and I’ve found that you need to be still and not moving in most instances if you want a stable VOIP connection. The funny thing is, even though I’ve been using the 3G a lot, on applications and websites such as Reddit, Google Maps, and YouTube, I’ve actually only used around 500MBs of bandwidth. The internet is fast by 3G standards and rarely do I find spots where I cannot connect to the 3G. The London Underground is the only exception. As you can see the picture on the left hand side, I manage to get around 4 MB per second of download and around 0.5 MB per second of upload. 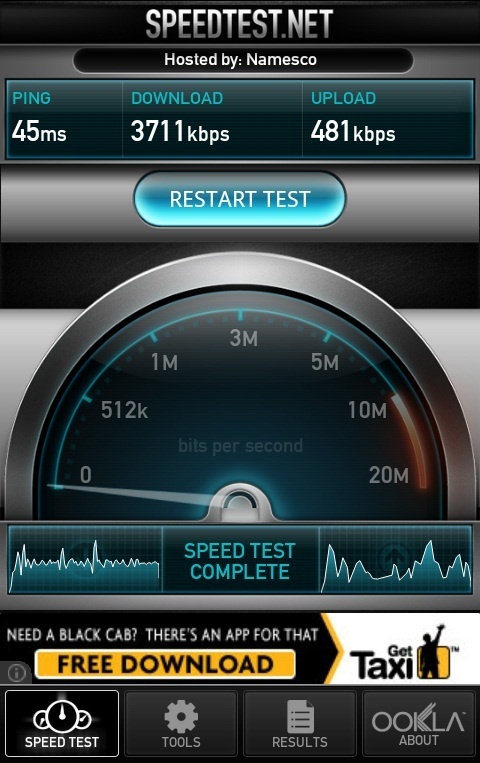 I haven’t really experienced any faults with this network and I think the network is pretty reliable. I live in Zone 3 and travel regularly to Zones 1 and 2, so take this review of their network with a grain of salt if you live up north or anywhere outside of London. For me, in London, the network is just as reliable as any other and there really have been no issues thus far. To illustrate this, I can say that I’ve used exactly half of the 250 minutes (Literally 125 minutes left) that came with the £12 Goodybag, and I’ve sent out over 200 text messages to only god knows who! What I also found pretty nice was the fact that you get a summary of how much you’ve used 2 days before your renewal date. Due to the following image/information, I’ve decided I’m going to downgrade to the £10 Goodybag as I really don’t need the unlimited internet and because that Goodybag would also give me 500 minutes, instead of 250 minutes. Also note, I have indeed actually used 125 minutes; however, the above image does not reflect that since this information was sent to me via e-mail 12 hours ago. Apparently I had only used 80 minutes of call-time, 12 hours before and I suddenly made enough calls today to last 45 minutes, which is another reason why I’m switching to the £10 Goodybag, as the minutes seem precious at this point in time, especially considering I’m only using half a gig of bandwidth. This network is quite unique in the fact that it uses an old-school technique of providing support. The network has a forum setup, as part of their website where you have contributors, and generally people who use the service who can help you if you run into problems. Additionally they have a system setup called “PayBack” where if you answer questions and offer the best solutions, you’ll get money off the next time you pay for your subscription. All in all, I’d give giffgaff a rating 9 out of 10, as there’s always room for improvement, which is why it doesn’t get a 10 out of 10. I’ve recommended the network to friends, family and even co-workers. If anything, give their smaller packages a try and if it works out, it works out, but if doesn’t then it’s only a small loss. I hope this was helpful! As you may or may not know, giffgaff do not operate any stores on the high street, so you cannot walk into a store to ask for a SIM card. You have to go to their website and register for a SIM card and it will typically take up to 7 days for the SIM to get to you. For me, it took around 3 days to get to me; although, I do live a mile away from Stratford’s mail distribution centre, so I get things relatively quickly. It may be different in other areas, but it should get to you within a week. The activation process was pretty generic and is typically universal when it comes to most network providers. However, safely to say I switched from Lebara (An overpriced network, which pretends to be cheap) to giffgaff with relative ease. You do need to put money onto the SIM card in order to activate the SIM’s phone number and everything else. Whether that be a pay as go cash amount or if you pick one of their Goodybags, the SIM should activate almost immediately. – In my case, it activated instantly and I was able to call people and text. You can activate the SIM card first, as explained in the above paragraph. It will give you a number that you can use temporarily while you try to obtain the PAC code for your mobile number. Once you obtain the PAC code, you should visit this page and follow the instructions. The only issue I had with this, was the fact that getting through to a Lebara representative to retrieve the PAC code for my mobile number (i.e. to transfer the number from Lebara to giffgaff) was quite troublesome; however, I managed to get through after 40 minutes. Other than that, there were no other issues. Once I got the PAC code, I followed the instructions as linked above. Once I submitted the PAC code to giffgaff, it took around a day for the number to transfer over to my giffgaff SIM card.